NO SOONER HAD I finished this fascinating book than I remembered the shattering scene in Irène Némirovsky’s Suite Française when the teenage orphans whom a fatherly priest has been shepherding to the safety of a secluded chateau suddenly turn on him like a pack of wolves and stone him to death. It is an unforgettable moment that seems to sum up all the madness of France’s panic in the summer of 1940. But in its almost Jacobin ghoulishness, the event is also mysteriously implausible. Now, after reading The Lost Children, it seems more decipherable. Throughout the war and after it, Europeans were completely obsessed with the fate of children. Everything—the health of society, the prospects for democracy, the future of the nation itself—was believed to depend on their well-being. And so much threatened their tiny souls: the war destroyed hearth and home, forced families apart, and flung people together in temporary alliances that could not last. In her portrayal of the precise moment when civilization collapsed, revealing its most treasured possessions to be no more than a bunch of feral psychopaths, Némirovsky captured the deepest anxieties of her generation. Tara Zahra, a historian who made her name writing about the ambiguities of nationality in Czechoslovakia, has now added an important contribution to the growing literature on Europe’s reconstruction after World War II. Children—what was happening to them as a result of the war, and what to do with them after it—turn out to have been at the epicenter of what she terms a “psychological Marshall Plan.” Through the arguments about children we come to learn much about postwar Europe’s state of mind. In fact, the intense debate about how to care for children and bring them whole out of the war’s devastation was already underway before the end of hostilities. The wartime anxiety articulated by Suite Française also permeated the Czech fortress ghetto Terezín, where Jewish educators debated the appropriate pedagogy for the children in their care. And this was just the beginning. After the war, the arguments intensified. Should children be brought up as self-reliant individuals, or were they to see themselves as part of a collective? If the latter, was their natural unit the family or the nation? This dilemma posed itself with special force for Jewish children, because so many families had been destroyed, so many children were left parentless, and the chances for any resumption of Jewish communal life in Europe seemed remote. But it was not only Zionists who sought to claim children for their national cause. 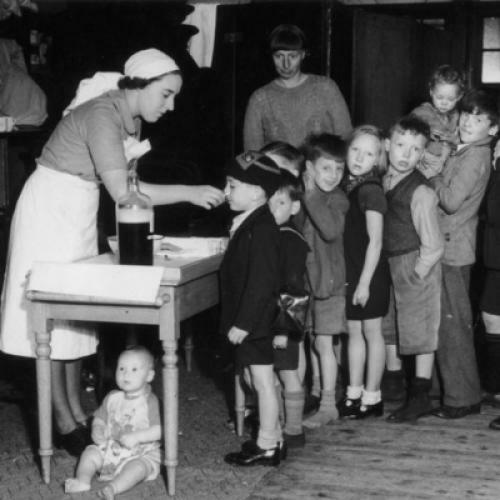 With the credibility and the prestige of Europe’s nation-state model challenged by the experience of Nazi rule, most political activists keen to guarantee the rebirth of their nation at liberation regarded children as a precious resource. Several decades of demographic scaremongering had not helped. Orphans in particular found themselves fought over in a fashion not so different from the way Nazis had tried to claim blue-eyed and blond-haired Polish children during the war. But now the children in question were born to German women and French soldiers, and it was the French authorities who sought to bolster their war-torn country and weaken the boches by grabbing children for themselves. To Germany’s east, Czech officials acted similarly, and one of the many virtues of Zahra’s pan-European optic is to reveal the persistence of nationalism across the continent at the war’s end and the relative insignificance of the ideological divide of the Cold War in this moment of reconstruction. Czechs and Poles were as anxious to claim children as the French were, and for similar reasons. In every case, of course, it was a matter of the right kind of children: Jewish babies or black babies were not wanted, and a government might at one and the same time be trying to keep half-German babies in and push Jewish children out. Another theme that runs through Zahra’s book is the mistrust that officials, psychologists, and activists shared for parents. This was not just a matter of pursuing orphans: most of the children in displaced persons camps, for instance, had one or both parents and other close relatives alive. But could parents themselves be trusted to live up to their ethical and psychological responsibilities (this was where many of the professionals had their doubts), or to bear their responsibilities to the nation? Thus the postwar years saw two contradictory trends: on the one hand, the revival of a discourse of familialism that made the nuclear unit the core of social stability and ultimately turned the 1950s into the most conservative decade of the century; and on the other, the emergence of a new state activism that supervised parents and children alike, and intervened in unprecedented ways in their personal affairs. The most extreme form that this intervention took was kidnapping, something we associate with the Nazis’ Germanization campaign in occupied Poland in particular. The shadow of Roald Dahl’s Child Catcher—immortalized in the film version of Chitty Chitty Bang Bang­—hangs over these pages, especially as the organized seizure of children continued after the Nazi defeat. Zahra tells several extraordinary stories. In 1946, a few Polish Jewish survivors criticized Zionist representatives who had spirited off their children from communal children’s homes in order to smuggle them into Palestine against the wishes of their parents; but despite their protests, they failed to secure their return. Another episode comes from France a few years later, in the so-called Finaly case, where a tug-of-war over two Jewish boys between their surviving relatives and the Catholic crèche headmistress who had sheltered them degenerated into outright abduction by the Church, which smuggled the boys into Spain. The case made national headlines and led some observers to fear another Dreyfus affair until the boys were returned to their relatives in 1953, a decade after their parents, who died in Auschwitz, had parted with them. One thinks, too, of the accusations of child abduction leveled by both sides in the Greek civil war; the so-called “child-gathering” of the leftist rebels, who spirited thousands across the Albanian frontier and into a life behind the Iron Curtain, remains contentious to this day. Zahra is especially good at tracing the connections between pedagogic theories and nationalist politics, and her rich source basis allows her to demonstrate the ubiquity of the problem. Was there anyone in the 1940s who did not worry about Europe’s future in terms of its children? And yet the children themselves are only an intermittent presence in these pages, entering as a source of strife and disappearing once the conflict over them is resolved. Compared with some recent popular histories, their voices are infrequently heard here, and as a result one cannot help but wonder whether all this anxiety about their psychic resilience was really warranted. There is not much worth reading on the long-term impact of wartime on children, but what there is suggests that kids are on the whole a tough lot, able to thrive in the most extraordinary circumstances and with a remarkable capacity to develop their own sense of what is happening to them. Perhaps, from the child’s viewpoint, Némirovsky’s kindly priest-guide and Dahl’s sinister Child Catcher were two sides of the same coin. On the basis of this book, there would be much to support such a view: when World War II ended, it was the adults who were lost. Mark Mazower teaches history at Columbia University.